H.H. Swami Chidanand Saraswatiji's motto in life is, "In the Service of God and humanity." Pujya Swamiji is President and Spiritual Head of Parmarth Niketan Ashram, Rishikesh, India of the largest spiritual institutions in India. He is also Founder/chairman of India Heritage Research Foundation (IHRF), an international, non-profit, humanitarian foundation. Pujya Swamiji is also a leader in the massive Clean Ganga Movement. He has dedicated the next five years of His life to this huge, comprehensive program spanning Gangotri to Ganga Sagar. The program includes everything ranging from solid waste management to sewage treatment plans to full civic re-planning for the villages/cities on the banks of Ganga. Uniting people from across India and across the world in the name of saving Ganga, Pujya Swamiji is giving a new direction to this crucial crisis. Pujya Swamiji is the recipient of innumerable awards, including the Mahatma Gandhi Humanitarian award, Hindu of the Year Award, Prominent Personality Award, by Lions' Club, Best Citizens of India Award, the Uttaranchal Ratan (Jewel of Uttaranchal) Award and the Bharat Vikas Parishad 1st Utkrishtta Samman Award. Radhanath Swami was born in America and now travels regularly throughout India, Europe and North America, sharing the teachings of Bhakti-yoga. He resides much of the year at the Radha Gopinath Ashram in Chowpatty, Mumbai. For the past twenty-five years he has guided the community’s development and has directed a number of acclaimed social action projects including Midday Meals, which daily serves more than 260,000 plates of sanctified vegetarian food to the children of the slums of Mumbai. He has also worked to establish missionary hospitals and eye camps, eco-friendly farms, schools and ashrams, an orphanage, and a number of emergency relief programs throughout India. Sacinandana Swami has been a monk in the Bhakti tradition for 42 years. He is known for his significant contribution to the practice of contemplation and meditation for modern practitioners of Bhakti. Sacinandana Swami has published seven books and released two CDs, and offers an array of retreats, seminars, and workshops. Thousands of enthusiastic singers and dancers visit his kirtan concerts. 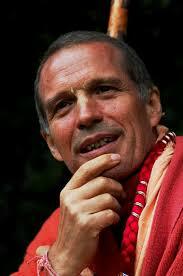 He teaches at the Vrindavana Institute for Higher Education in India and the Bhaktivedanta College in Belgium. Furthermore, Sacinandana Swami serves as the spiritual guide for the Veda Academy, which is active in eight countries, and recently founded the organization, "Yoga Is Music". Raoul Goff is the founder and publisher of Insight Editions and its imprints, Mandala Publishing and Earth Aware Editions. Earth Aware Editions presents the diverse voices of today’s leading environmentalists, photojournalists, cultural commentators, artists, and activists. For over 30 years, he has created and published award-winning projects in partnership with luminaries such as Robert F. Kennedy Jr., Mikhail Gorbachev, Leonardo DiCaprio, Robert Redford, Andrew Kimbrell, Jane Goodall and Wade Davis. Raoul supports many organizations in the field of sustainability and runs a 42-acre organic farm on the Hamakua Coast in Hawaii. He has worked with numerous environmental education organizations, including the Foundation for Deep Ecology, Ocean Song Farm and Wilderness Center, and the Hamakua Ecology Center. He is currently a board member of NatureBridge (www.naturebridge.org). Gauri Das is a senior advisor and former president of the Bhaktivedanta Manor (UK). He joined ISKCON in 1983 and has served in both the UK and India. At present he serves as the co-executive secretary of ISKCON. He is also a director of the Ahimsa Milk Foundation and the Lotus Trust. He has served as the spiritual commissioner of the Hindu Forum of Britain since its inception, which is the UK's largest umbrella body of Hindu organisations. He is also a member of the Hindu Christian Forum and the I-Foundation. Manoj Kumar Misra is a Forestry and Wildlife expert, who formerly worked with the Indian Forest Service, IFS. Today he is the Executive Director of the PEACE Institute Charitable Trust and Convenor, and head of Yamuna Jiye Abhiyaan, the Yamuna Forever Campaign. He holds Masters degrees in Mathematics, Forestry and Wildlife Management. Serving in Indian Forest Service (Madhya Pradesh/ Chattisgarh cadre) for 22 years, he rose to become Chief Conservator of Forests (CCF) before seeking voluntary retirement. He also worked in WWF, Delhi. He then founded PEACE, an NGO dedicated to promote the cause of nature conservation in 2002. He has completed over 22 projects of various kinds and sizes before leading the campaign for the revival of river Yamuna since November 2006. He published over 100 articles in various magazines, journals and newspapers.